The scene inside Carolyne Roehm's stunning apartment with the city lights beyond. 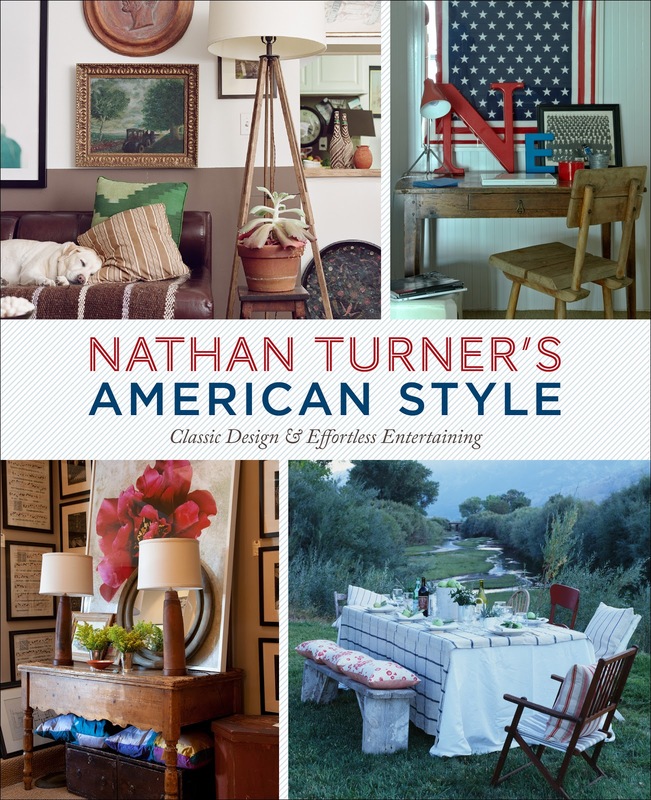 Decorator Nathan Turner has a new book out called Nathan Turner's American Style, and TD and I were recently invited to a party at Carolyne Roehm's beautiful apartment to celebrate its publication. 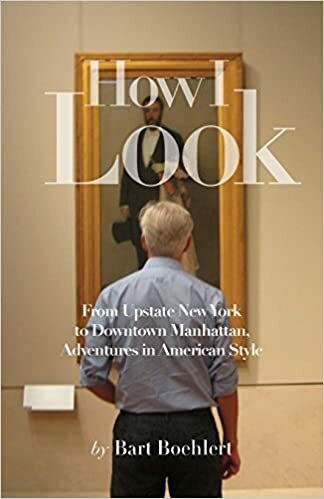 You remember Carolyne Roehm's beautiful apartment; TD and I spend an afternoon there when Carolyne herself was publishing a book, and made a video (or two). That post about Carolyne is the third most popular post of all time on the blog, followed only by Coco Chanel and Marella Agnelli. And we have a new treat featuring Carolyne coming up soon on the blog. I admired Nathan Turner's work from what I had seen on the tv reality show Million Dollar Decorator; it looked enticing and inviting and not over the top. On the way into the party, we passed Kyle Maclachlan and his wife Desiree Gruber who were leaving. Our hostess Carolyne looked glamorous and gave a warm toast to the author. The soaring two-story living room was illuminated with candles. We chatted with people and turned around to see Sarah Jessica Parker who was talking excitedly with friends. It was fun to see her there. Not tall, messy pony tail, dark smokey eye makeup. It looked like she was wearing a white Oscar de la Renta dress with gun metal grey sequins, with black bra straps showing underneath, and towering tall black what-looked-like Manolo Blahnik pumps. She was a wonderful combination of high and low style, elegance and ease. Which brings us to Nathan Turner. I found the author in a corner, wearing a tweed suit and an affable smile. I asked him about his American style. "I feel like I am very American," he said. "I grew up in northern California and my mother's family had a ranch. I drive a Ford pick-up truck. We Americans are a bit laid back. It's a barefoot, fuss-free style." 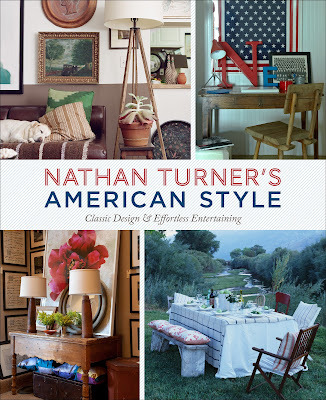 Nathan's book celebrates his decorating projects in the city, in the country, and at the beach. His work is colorful and casual, and he has a good eye for mixing different elements together to create rooms that are sophisticated yet comfortable, which is the hallmark of American design. His interiors have an ease and a natural quality which make them friendly and appealing. 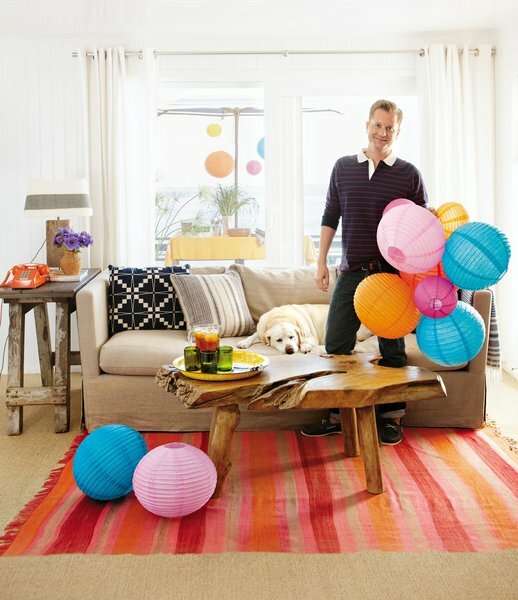 In his book he writes,"My approach to decorating and entertaining is all about finding new ways to live and celebrate with low effort and high style." I like his thinking. I follow Carolyne almost to the point of stalking! If she approves of Mr. Turner, I know I will too. I hope he remains unaffected by his celebrity! I'm a big fan of Carolyne Roehm's entertaining style. It must have been a delightful experience attending a party in her apartment. How I wish that the interior design of the apartment we rented for the holiday will be just like that. I'm so excited now for our upcoming vacation.